If you are like me there are some foods that I turn to when I feel like a touch of home (Newfoundland). 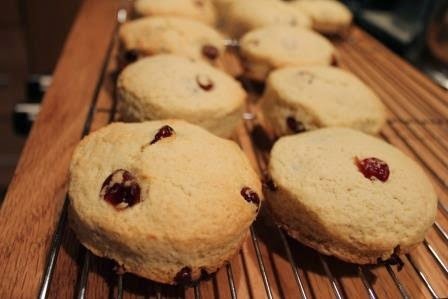 Homemade bread, Jigg's Dinner, Gumdrop Cake and Tea Buns (smaller relative of the Tea Biscuit). 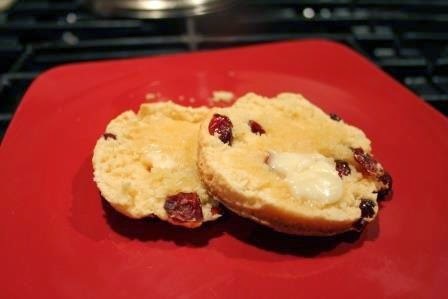 Here's my step-mom Irene's Tea Bun recipe. It was a favourite of my Dad and Brother, Calvin. There's a good reason why... they're delicious! 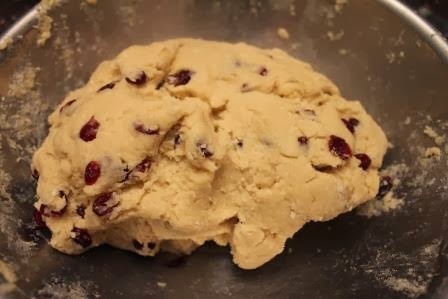 She usually makes them with or without raisins, but for this version I used dried cranberries. I don't think the buns suffered for it. 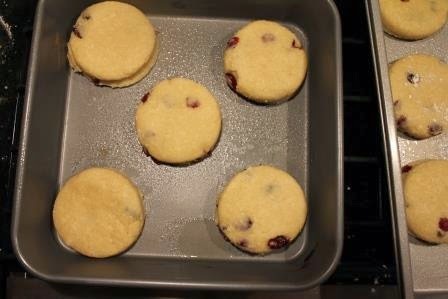 Take a large bowl, sift together flour and baking powder. Mix in sugar, salt, and coconut. Give a good stir to mix. Rub in chilled butter. What does "rub in" mean? If you have ever made a shortbread base for squares it's basically the same method. 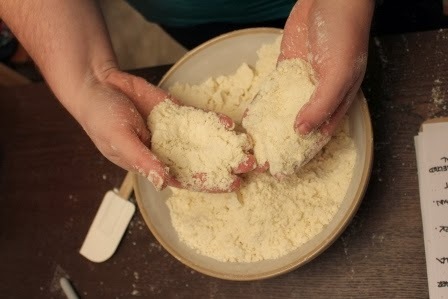 I cut my butter up into small chunks and then using my hands work the butter into the dry ingredients until it completely incorporated and resembles a cornmeal. 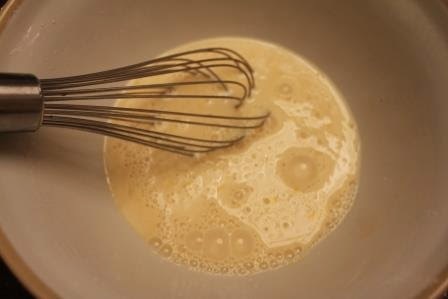 Beat together the eggs and milk. Add vanilla. Wash Hands. 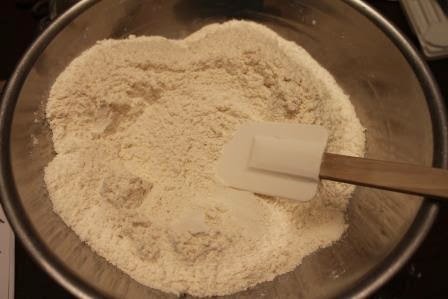 Add wet mixture to dry ingredients. I use my hands to mix everything together. 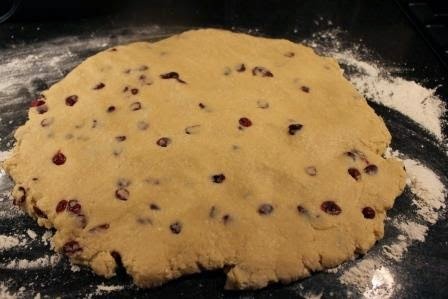 I don't like to over work the dough. Add dried fruit and work until happy. Pat mixture out onto floured surface to a height of about 1/2 inch. 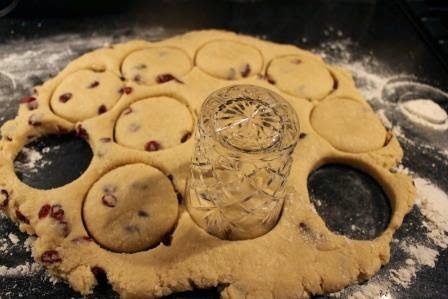 Take a glass (tumbler) and cut out the circles. The size of the bun is determined by the size of the glass. Put on greased baking pan. Don't crowd them. They don't spread out (just up) but it's simply my personal preference. Bake at 400F for 10-15 minutes until golden brown. I start checking at the 10 minute mark in 2 minute intervals. Place on cooling rack and enjoy. If you are like me, I take one right away, cut it in half and slather butter on it. 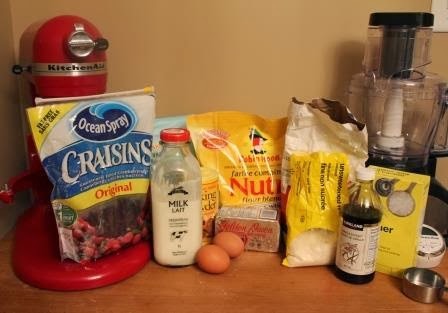 Like my Aunt Beth's Gumdrop Cake recipe, I hope that this one can become a part of your family's tradition too.